Ayondo was established in 2009 and comes under the jurisdiction of the Financial Conduct Authority (FCA), so is regulated in the UK. It provides an online trading platform for many different markets, as well as allowing social trading signals, which you can use to follow the trades of other hopefully successful traders. The trading platform is called Tradehub, and is a modern and intuitive software solution. The package from Ayondo includes mobile trading on both iPhone and Android devices. The platform is fully customizable, and you can set your own colours for easy viewing. Available products include both spread betting and CFDs (contracts for difference), both of which are designed to be tax efficient ways of trading, available in most countries though not in the US. Both products allow trading on equity indices, Forex pairs, thousands of shares, commodities such as crude oil and gold, and on interest rates, such as the Bank of England UK interest rate. In use, you can search for products, and use filters to select, for example, only index products. To trade you simply click on the buy or sell button that comes up, which brings up a deal ticket for you to complete your transaction. 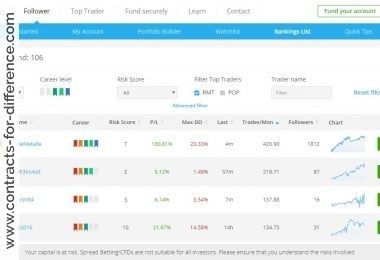 You are free to select the notional amount you want to trade, and the platform gives you free guaranteed stops, for which many other brokers charge you extra via a wider bid/ask spread. To help control your risk and exposure, you can even set the amount of margin that you feel comfortable using. We have always advocated controlling your margin, and not simply accepting the maximum that your broker will permit. If you are not cautious, you might be inclined to over leverage your positions, exposing you to an unacceptable larger loss if the position moves against you. The platform provides fully featured charting software, and you can trade directly from this view, too. 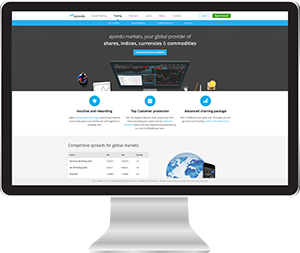 Whichever way you choose to trade, the trade execution is fast and accurate. The spreads and rollover costs, where appropriate, appear competitive. Ayondo offers a free demo account for 15 days, so you can see if you like the software interface, and explore the range of products. Your live account can be funded in several convenient ways, which can also be used when you want to withdraw your profits. It has become expected in the industry that even a platform designed to facilitate trading should have extra information, and Ayondo is no exception. In addition to regular webinars, there are extensive training materials. But one thing that distinguishes Ayondo from many other brokers is the inclusion of social trading. Social trading allows anyone to follow the trading moves of Top Traders, and make sure that their account echoes the same trades. While no one is going to guarantee profits, by setting your account to mirror previously profitable traders you have a reasonable expectation that it may perform better than you could do on your own. You can select to follow up to five Top Traders with your account, and the money is spread out equally between them. Ayondo has hundreds of Top Traders, and their records are available for anyone to see and evaluate. There are even small charts that show the changing value of their accounts, giving a graphical representation of the expected volatility if you choose to follow them. 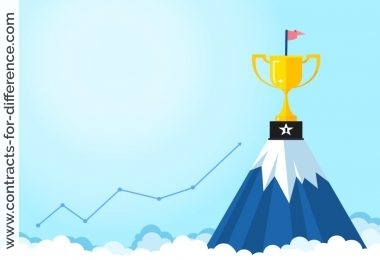 The top traders benefit from commissions paid to them by Ayondo, and commissions depend on the number of followers they attract. Ayondo is not the only social trading site out there, but coupling this facility with an intuitive flexible dealing site means that it is a full-service solution for those who are attracted to this type of trading.